It occurred to me in reading John Paul Newport's WSJ column summarizing the latest on drug testing in golf that the people who touted the sport's nobility really sound more and more absurd as you hear doctor's quoted about the potential benefits of performance enhancing drugs. 'Clearly a golfer doesn't want to develop the physique of a Division I linebacker. That would be detrimental," Dr. Yesalis says. "But a 170-pound player could use low doses of steroids or a testosterone cream to help him add 15 pounds of lean, flexible muscle to his body. Please tell me how that wouldn't help him to hit the ball farther." In such low doses, Dr. Yesalis said, steroids would have negligible if any effect on a golfer's ability to concentrate or stay calm -- another contention frequently made by those who argue that golf and doping are inherently incompatible. Nor would they necessarily be detrimental to the golfer's long-term health. Synthetic hormones like human growth hormone, or HGH, which also would be banned under the Tour's testing protocols, are routinely prescribed by doctors for middle-age people looking to build or retain strength. 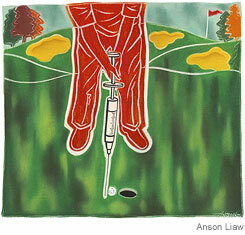 For golfers, one of the prime benefits of low-dose steroids or HGH would be to let them practice longer. Long sessions at the range produce microtears in the body's tissues. Especially as players get older, slow recovery from these sessions is an obstacle to performance. Banned drugs could speed up the recuperation. The tradition of golfers playing by the rules and even calling penalties on themselves is undoubtedly one of the game's grandest and most admirable attributes. But given the increasing sophistication of every other aspect of player performance these days, from advanced physical and mental-game training to precise, technology-aided club fitting, how long can it be before at least a few players give in to the temptation of better living through chemistry? If they haven't already.